To Sing of Beauty presents two video installations that celebrate Blackness by Northwest artist C. Davida Ingram and Atlanta-based Paul Stephen Benjamin. Working from two different regional centers, Benjamin and Ingram combine video imagery and music to make exquisite statements about the power and beauty of Blackness. For her video diptych, The Deeps: Go Away from My Window, C. Davida Ingram features her collaborators, composer and vocalist Hanna Benn and actress Rachael Ferguson. Their duet is a powerful statement of desire and longing. In the paired video Procession, Ingram conjures a sense of the African American Northern Migration via railway with the shifting landscape of contemporary Seattle. Paul Stephen Benjamin generates a musical round by reworking footage of Nina Simone’s rendition of the traditional song, Black Is the Color of My True Love’s Hair, first recorded in 1959 at New York City’s Town Hall. He inserts a subtle audio shift to change Simone’s phrasing into “black is a color” that foregrounds the essence of Blackness—Simone wears a black dress with black boots, sports an Afro, and plays a black piano while sitting on a black bench. To Sing of Beauty was organized by Tacoma Art Museum. Right: Paul Stephen Benjamin, Black is the Color, 2014. 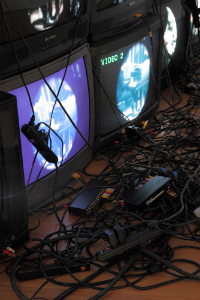 Looped video, salvaged televisions, and cords, Artist proof from an edition of 5, Dimensions variable. Courtesy of the artist.